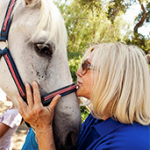 Blue Apple Ranch (BAR)/Toby Wells Foundation (TWF) is seeking loving, knowledgeable, safe and permanent homes for horses. 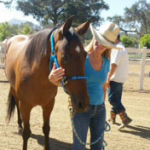 If you adopt one of our horses, you are making a lifetime commitment to that horse. If your circumstances change and you can no longer care for the horse, the horse must come back to BAR/TWF for re-adoption or retirement. All prospective homes for our horses are subject to our screening and approval. Following is the sequence of steps you must take if you want to adopt one of our horses. 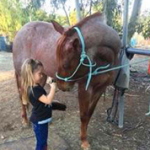 Arrange a visit to our ranch to meet the horse that you are interested in adopting by speaking with Adrienne at (619) 302-7266 to set up an appointment. It is not necessary that we have approved your application for you to come out and visit us, however a visit does not imply that an application will be or has been approved. You will be notified when your adoption application is processed. Processing of adoption applications may take as long as two weeks to complete, depending on how quickly we are able to reach your references and assess you application on the basis of information that you provide. An “on site” check of your facility, or the boarding facility where you plan to maintain the horse, will be conducted by one of our BAR/TWF team members prior to final approval of your application. When your application is approved, you must make a non-refundable, tax-deductible Adoption Donation to our adoption program and sign an Adoption Agreement with us. The actual agreement that you will sign is horse specific. Download here. 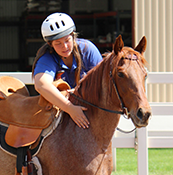 We occasionally adopt horses to first time horse owners, but only if you show sufficient evidence of horsemanship and riding lessons and training in progress, and plan to have  your adopted horse professionally trained along with yourself. Applicants must be at least 18 years of age and financially capable of supporting a horse. and exercise for the horse. Applicants must be able to provide at least ONE other equine companion. In the event that you are considering adopting a horse in the future, but not right now, many of our supporters enjoy visiting the ranch to learn about our mission and our horses. At present, tours of Blue Apple Ranch are by appointment only. We welcome appointments for adoptive horse visits which are conducted by management. We look forward to meeting you in person. Call (858) 391-2973 for an appointment.